The Amazon Kindle has become the leading eBook reader partly because of Amazon, partly because it's simply fantastic device that works and works well. There are several versions to fit your needs. Visit Amazon.com to see which Kindle is right for you. If you already have a Kindle, then feel free to download our Kindle version eBooks and transfer them for reading on your device. Each of our Kindle books is available at the Amazon.com store for $5.95, but as member of LensWork Online, you can download them them here as a free benefit of your membership. Enjoy! Format wars, just like every other classification of electronic gadgets, are a part of the eBook business, too. Although the Kindle is probably the leading format and device, there are plenty of competing devices that have virtues of their own. The ePubl format for book files has emerged as somewhat of a standard on all devices except the Kindle. The Barnes & Noble Nook, the Sony Reader, almost all Android eBook readers, and even libraries have adopted the ePub format as their standard. If your device is compatible with the ePub format, we recommend this version for you. Not to worry! You obviously have at least a computer or you couldn't be reading this. If so there are several eReaders software programs that will allow you to read eBooks right on your computer, laptop, or netbook. Try one of the Kindle Reading Apps from Amazon.com . There is also a wonderful software (our favorite) from Mobi called the MobiPocket Reader Desktop that is terrific on a PC computer. Each of these books can also be purchased in a standard paperback format for reading (ahem) the old-fashioned way if you prefer. 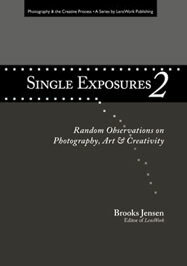 Free to LensWork Online Members! 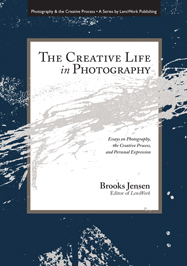 This latest book in the "Photography and The Creative Process" Series offers readers the opportunity to engage in a selection of timeless and thought-provoking articles previously published in LensWork, but many now long out-of-print. 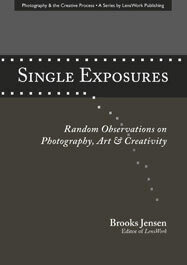 The 203 pages of text are organized in three important sections: Being an Artist, The Creative Muse, and Productivity. 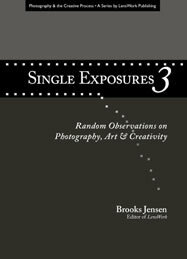 This book goes beyond useful; it is truly a "must read" for photographers who are committed to their craft. Download and transfer these versions to your eReader. Photography is, or can be, a way of life. Beyond cameras and equipment, beyond film and chemistry, beyond pixels and technology lie the mysteries of the creative life shared by those who strive to communicate and express themselves clearly. 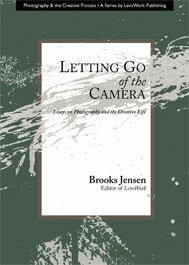 This book is an exploration of the path of creative photography. 186 pages.